Since I'm already In the neighborhood (i.e. Thamel) for almost 5 weeks, I think I do have some knowledge on good places to stay. I've been to a bunch of budget geust houses around here and must say that prices are about the same and vary 50 nr (Nepali rupees) from place to place. Hotel DownTown is the one place I liked (don't be confused with Down town guest house, it's a different place). The hosts thee are very nice. rooms prices starts from 150 nr (around 2.5$) per night in a single room without inside bathroom. If you are 2-3 people traveling together you can get away with 100 nr per person. The bad thing about budget hotels are that they have limited hours of hot water for showers, and even then the are not very consistent about it. Hotel down town has (almost) 24/7 of hot shower water (I've stayed there more that 3 weeks and I stumbled a cold shower just once). So, This is my pick! If your Budget is even lower than this, Freak street, would be the place for you. As I mentioned I didn't stay there, this is just from what I heard from other travelers. 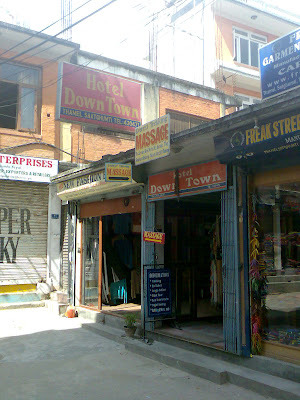 Freak street has limited selection of hotels and is around 20-25 minutes walk from the Thamel, which is where all the touristy happenings. But This blog is not about being a normal tourist, but being a traveler, get to know and experience places. So freak street can also be a nice experience.